The knee is made up of three bones, the femur (thigh bone), the tibia (shin bone), and the patella (knee cap). Cartilage, a connective tissue which lines the surface of these bones, helps provide shock absorption and increases stability & congruency at the knee joint. The cartilage in the knee joint doesn't have a blood supply and thus receives its nutrients through a substance called synovial fluid. The synovial fluid not only supplies the cartilage with nutrients but also provides lubrication for the knee joint as well. The knee joint can be damaged by disease such as arthritis or by trauma from falls, sports injuries or other accidents. Obesity and abnormal pressure on the knee joint can also result in trauma to the cartilage as well. As a result of disease or trauma to the knee, the articular cartilage can wear away resulting in an exposure of bone. When bone is exposed it is susceptible to further damage as it rubs up against other exposed bone. This rubbing of the bone can eventually result in symptoms such as pain, discomfort, tenderness, and swelling in the knee. These symptoms would often cause knee instability, limitations with bending & straightening of the knee and difficulties with walking & performing other activities which require weight bearing. The image provided displays an arthritic knee where the articular cartilage has been worn away resulting in the exposure of bone. Conservative approaches such as pain & anti-inflammatory medications, physical therapy, synvisc injections, cortisone injections, weight loss and activity modification are often tried first. Should these conservative approaches fail, lesser surgical approaches such as an osteotomy, arthroscopic debridement, or a synovectomy could be considered as well. Depending on the stage of the disease or extent of damage to the knee, a total knee replacement may be the only reasonable solution. A total knee replacement is a surgical procedure which involves the replacement of the worn-out parts of the knee with an artificial joint. A total knee replacement implies that everything about the joint is being replaced. In this is case it is simply not true. What is actually being done, is just resurfacing of the bones of the joint. The prosthesis that is used is made up of plastic and metal and is placed on the joint surface of each bone. Most of the ligaments and all of the tendons remain intact. This allows for the bones to glide against each other and allows for the knee to bend and move without pain. The image provided displays an x-ray of a total knee replacement where the femur and tibia have been resurfaced and replaced with a prosthetic surface. 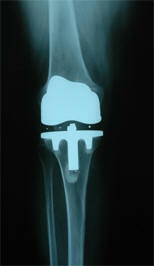 For more information on a total knee replacement please consult with your physician or visit www.comportho.com. 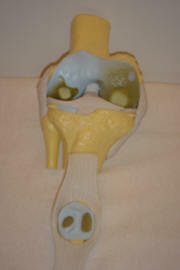 To view and interact in a virtual knee surgery, please click on Edheads.org- Virtual Knee Surgery.